Whether you sleep near the hustle and bustle of the city, share the bed with a partner who snores, or you simply want to play music during your slumber, headphones for sleep are the new in-thing to meet your demands. Sleep headphones aren’t exactly like the usual headphones nor earphones. Imagine sleeping with your usual earpieces - it could push on your ear canal as you sleep! You might lull your way into sleep, but wake up in discomfort anyway. The search for the best headphones for sleep entails knowing your preference to see what type of sleep headphones will suit you best. Here are a set of criteria that we’ve compiled to help you! People's reasons for purchasing sleep headphones can vary. Some purchase for noise cancellation features so that they can sleep in a peaceful environment. Some, on the other hand, use these headphones to listen to guided meditations, nature sounds, or music to ease their way to sleep. Over-ear: Over-ear headphones encapsulates the entire ear making it bulkier than the others. Sleep headphones in these forms are padded with flexible materials to ensure maximum comfort. On-ear: On-ear headphones have a hook-like structure that attaches to the ear helix so that it stays in its place despite movement during sleep. In-ear: In-ear headphones seals your ear canal providing the clear and sharp sound quality. However, it could end up digging into your ear canal causing discomfort. This is especially problematic for side sleepers. Headband: Headband headphones are thin earphones placed inside a breathable headband. Usually, these sleeping headphones also double as an eye mask to ensure a good night's sleep. Pillow speakers: Speakers placed under the pillow allows the pleasure of listening to white noise, music, or even ASMR by simply placing your ear over the pillow. This is the optimal choice for side sleepers. 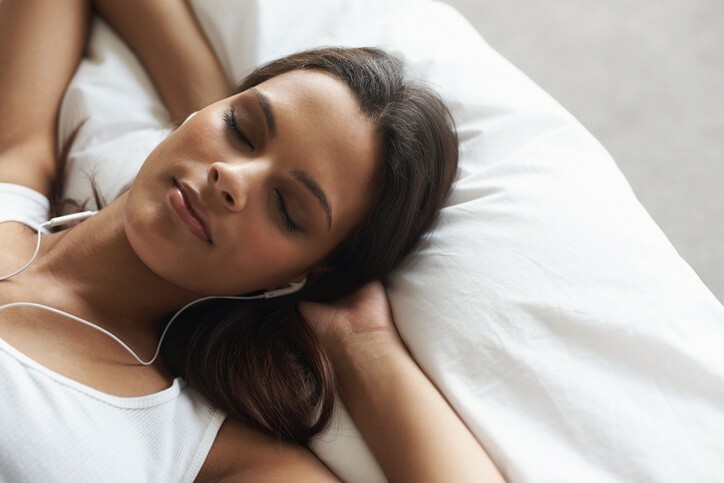 Whether you are a side sleeper or a back sleeper, how you sleep is a crucial factor in making your sleeping headphones purchase. Aside from what was already mentioned, whether or not you toss and turn in your sleep is also a criterion to determine if wired or wireless Bluetooth headphones are the one for you. The Bose QuietComfort 20 are wired in-ear headphones that are perfect from day to night. It has noise cancellation features alongside an aware mode that can temporarily disable it. This balance allows it to easily transition from day time use to sleep time. It has an inline remote that enables volume control and incoming call control. The Bose QuietComfort over-ear wireless headphones take noise cancellation to the next level by providing three levels of control. You can adjust it based on how noisy your surroundings are. Despite being in over-ear form, these sleeping headphones remain comfortable with its high-quality headband padding. Plus, one charge can last up to 20 hours of battery life. AcousticSheep Sleepphones provide a comfortable experience with earphones that you barely feel. You can choose between a fleece or breeze fabric options wherein fleece is made for sleeping. It is luxurious to touch but also easy to clean and keep hygienic. There are wired and wireless options which are perfect for any sleeping style. With the Panasonic's slim design along with its on-ear built, these earphones are made for sleeping. Its ergonomic hook allows it to stay attached to the ear even if you move around during sleep. Simply place your Pillowsonic Stereo Pillow Speaker under your pillow and your music is ready to play. Even with the pillow in between, the pillow speaker can continue to play your sleep jams in high quality. It requires no charging so no need to fret about battery life. Connect it to your phone or any sound source and you're good to go. Wake up feeling refreshed with the help of relaxing and comfortable sleep. Aid your good night sleep with your favourite tunes or a little ASMR for some tingling sensations. One thing is for sure, make it a more pleasant experience with the right headphones. Happy shopping!